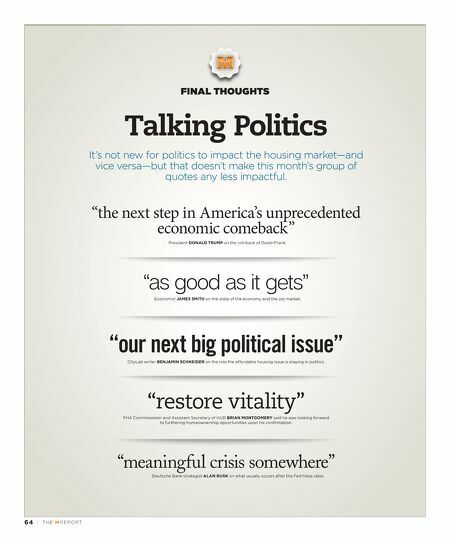 64 | TH E M R EP O RT FINAL THOUGHTS Talking Politics It's not new for politics to impact the housing market—and vice versa—but that doesn't make this month's group of quotes any less impactful. "the next step in America's unprecedented economic comeback" President DONALD TRUMP on the roll-back of Dodd-Frank. "as good as it gets" Economist JAMES SMITH on the state of the economy and the job market. "our next big political issue" CityLab writer BENJAMIN SCHNEIDER on the role the affordable housing issue is playing in politics. "restore vitality" FHA Commissioner and Assistant Secretary of HUD BRIAN MONTGOMERY said he was looking forward to furthering homeownership opportunities upon his confirmation. "meaningful crisis somewhere" Deutsche Bank strategist ALAN RUSK on what usually occurs after the Fed hikes rates.